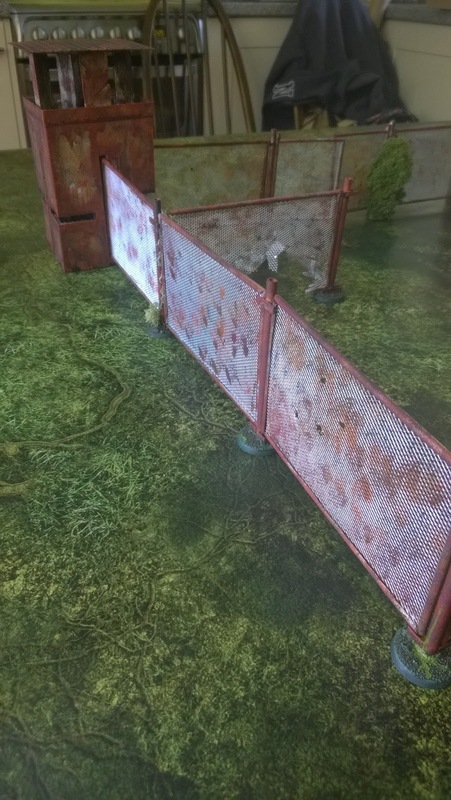 Short post today to showcase my completed Aegis Defence Line ahead of our first two games scheduled for Monday 9th May. A few months in the making but it has definitely been worth it I have achieved so much painting as a result of this story campaign. We are hoping to produce a video battle report of at least 1 of the two games if not both. So the last thing I needed to paint was my Aegis. I have been putting it off as it didn't float my boat and well lets be honest the knight is far tastier. On the knight I should be in receipt of the transfers this weekend which will be cool and allow me some more progression on that in the near future. Back to the Aegis (Doc!) 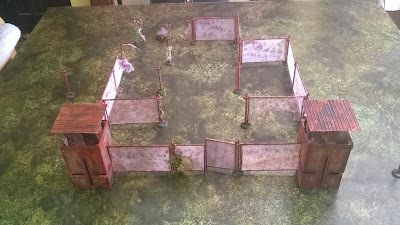 It has been painted to match my ever expanding 19th Dicers IG regiment. If you look in the side bar there are a couple of videos which showcase some of the work on this regiment. I am hoping in the near future to borrow Innermech's light box and take some more photos of the wider army and other things in my collection. 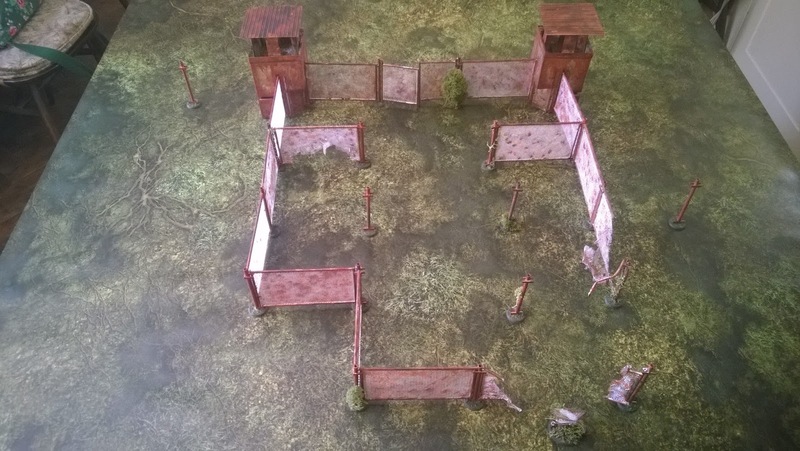 Showcase; The Cypra Incident, Watchtowers and Fencing. 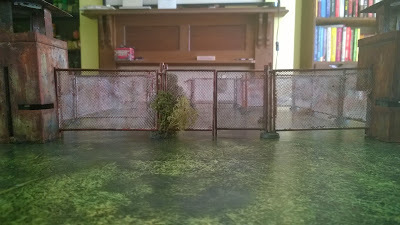 I've now completed the Watchtower and Fencing project for our upcoming campaign; The Cypra Incident, which will see Space Orks and Imperial Guard battling it out in a swamp initially. 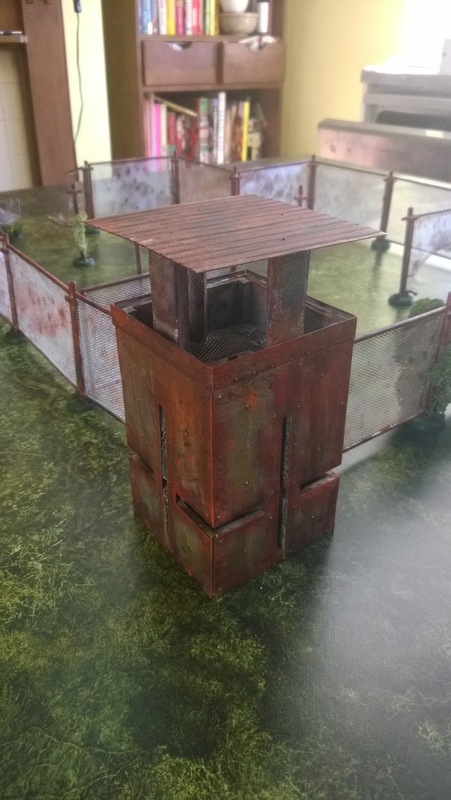 I'll go back at a later date and add a few more pieces to the set, such as 2 more intact towers, a ruined tower and some barbed wire once my order arrives. 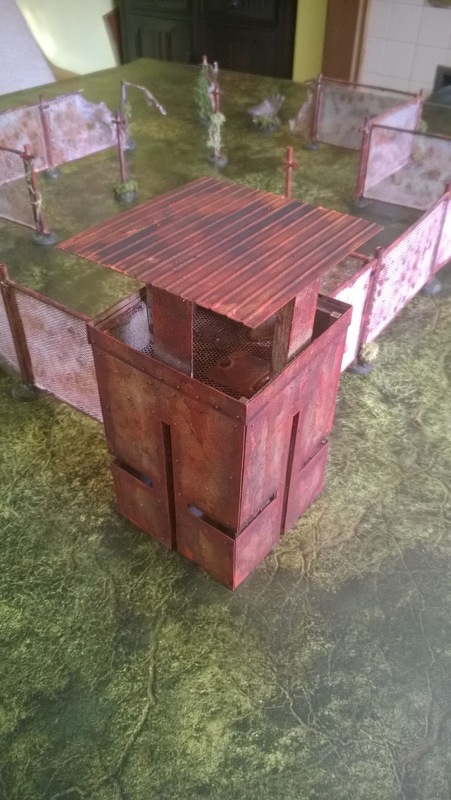 I'm pleased with the finish, very rusty and aged, just what I'd aimed for. 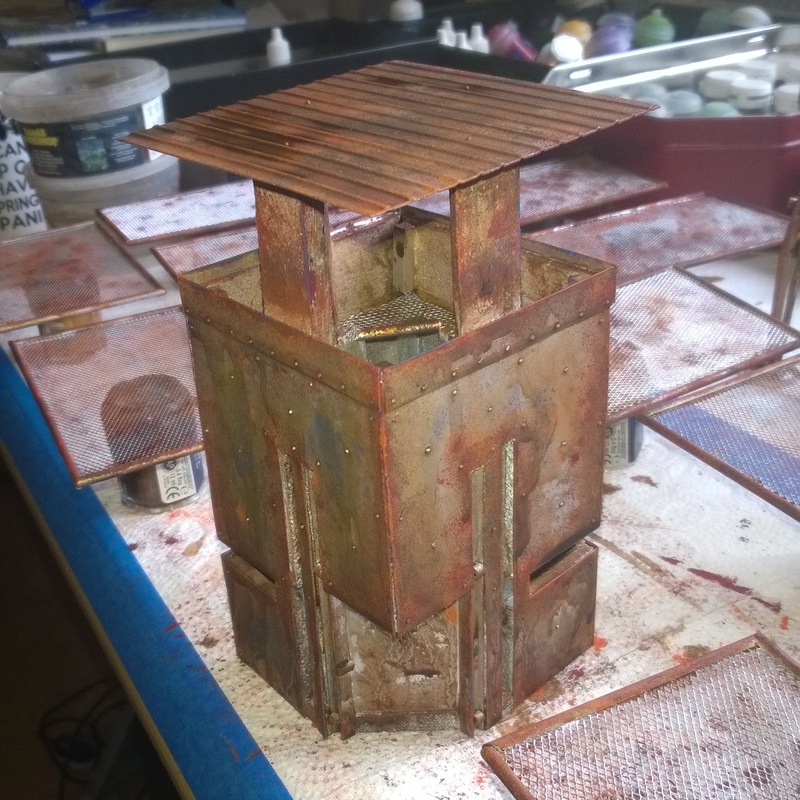 Also tried sponge weathering for the first time and I'm very pleased with that, I'll be using it again for sure. As you can see the set is a decent size (that's a 4 x 4 board) and has plenty of scope for variation of lay-out. 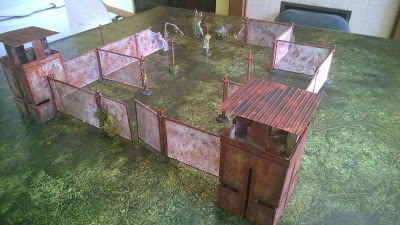 Overall I'm very happy, the project turned out better than I'd hoped and the modular system is ideal. As ever c & c welcome. Hope you like it. Next up I'm going to build and paint something for my Marine army, the Thunderbolts, more to come on that soon. I have been working away on my knight acheron. 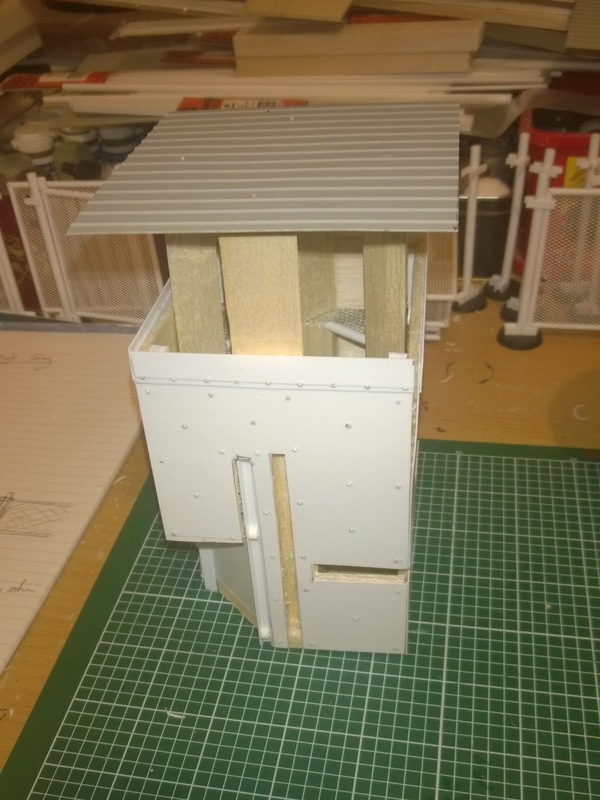 I wanted to get it to a usable state whilst I await delivery of transfers to finalise the model. I have taken the odd photo along the way to show you some progression. This has been a really enjoyable process so far and I look forward to the final model being finished. I had already decided to loosely follow the House Makabius colour scheme although I decided on a metallic brighter blue than the forgeworld example. 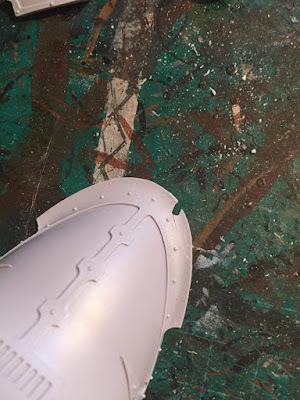 To test it out I just did one shoulder pad. The airbrush finish on the blue and cream is so flat and makes me wonder why I would ever do it the "old way" again. At this stage no washes had been applied. From here I upscaled to multiple panels including masking the shin plates to ensure a crisp line between the cream and blue. 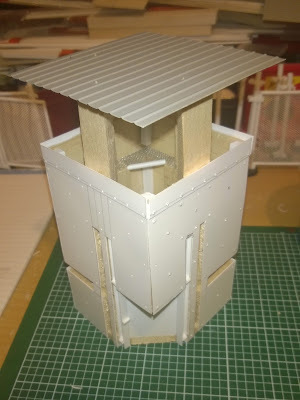 For info I use the tamiya masking tape range for this purpose. 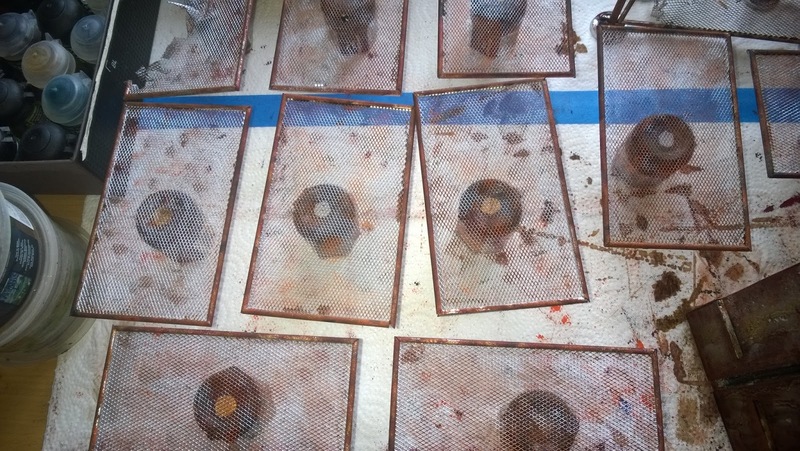 Flamer tanks completed..... A whole mass of effects and mediums used on here. Airbrushed vallejo silver. Some areas airbrushed vallejo rust. 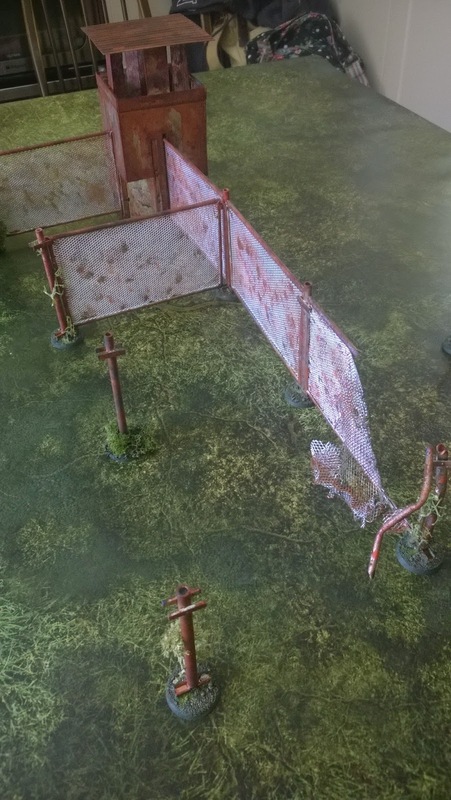 Then washed with agrax and nuln oil. Drybrushed boltgun metal. Next I went in with a whole load of effects to weather it up using the products below. So as usual with me after this point got really into it and picked up the pace now I was comfy with the colour scheme and techniques below is a picture of the knight as it stands. Still decals, weathering, base and many more little jobs to do. What do you all think so far, any advice? Hope to have it all finished in the next few weeks. 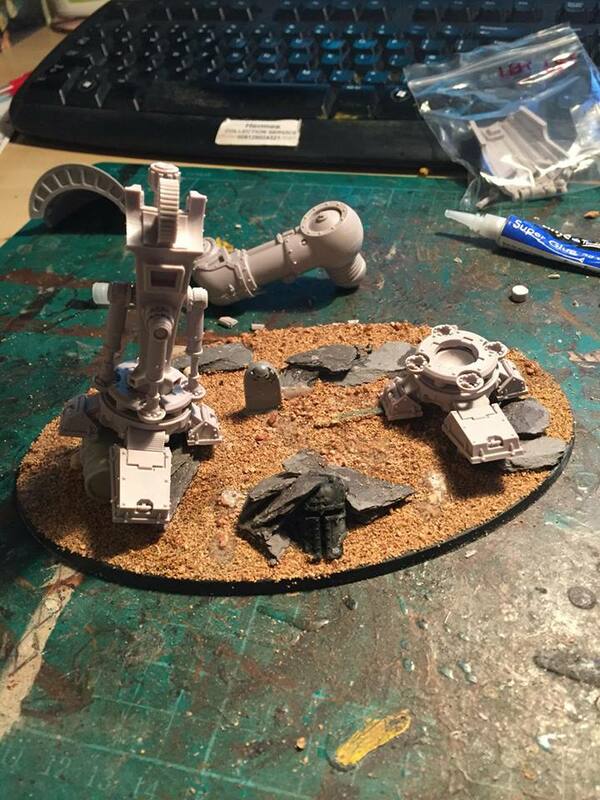 Spartan Assault Tank - FW's Hardest Kit to Build? Not been on here in a little while but have successfully built the hardest GW kit in the world the Spartan Tank. More specifically the version before they changed the design and molded it with the tracks on. I also made the mistake of trying to carry on with this when in a foul mood! That as we all know simply doesn't work! God Bless the elastic bands and the stolen from the better half hair bands! Picked the forgeworld brass etch for this tank. The next two photos show the tank in primer and me starting to lay down the shadows. Genuinely hated this build so glad it is out the way now. This is not my current painting project but I will return to it in the next few months. 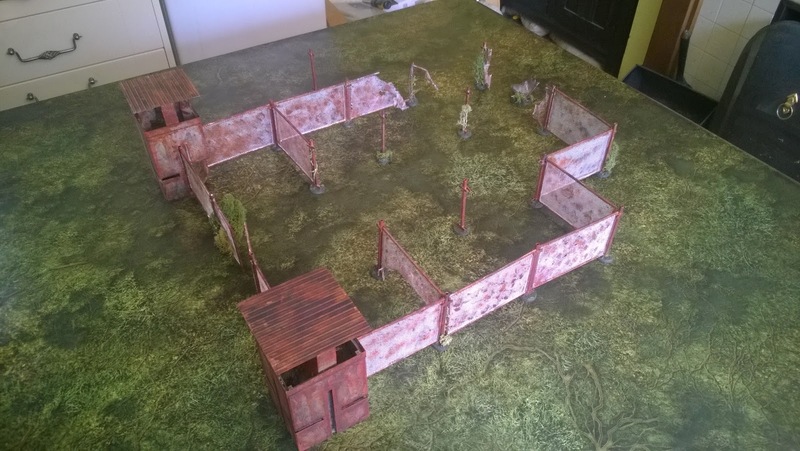 Thoughts on your experience with this kit would be interesting and also any good stories about when you should stop modelling might help! The Cypra Incident, more terrain WIP. Bluddtoof here with some more WIP on my current project; the fencing terrain for our upcoming narrative campaign; The Cypra Incident. 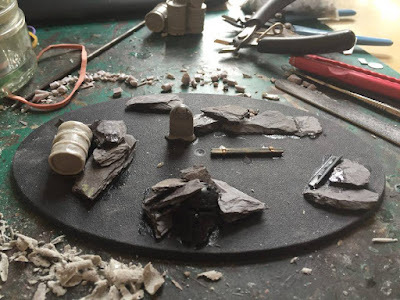 I'd planned a post over the weekend and even took photos but didn't get round to it so this post contains photos from a couple of stages in the process. Then I moved on to painting, all the pieces got a solid black base coat sprayed on followed by a coat of silver; I used a spray by Plasti-kote, I've used this before and found that it covers exceptionally well but has a glossy finish which doesn't like to accept further painting. 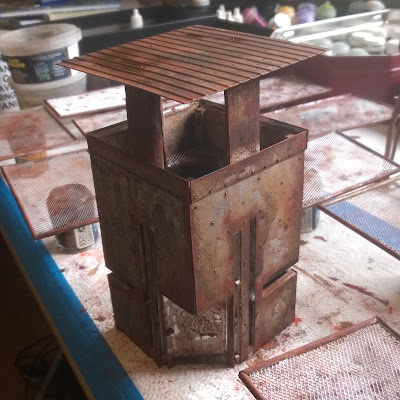 I tried a single small piece of scrap plasticard first and tried out a new method for applying rust effects, namely sponge weathering. 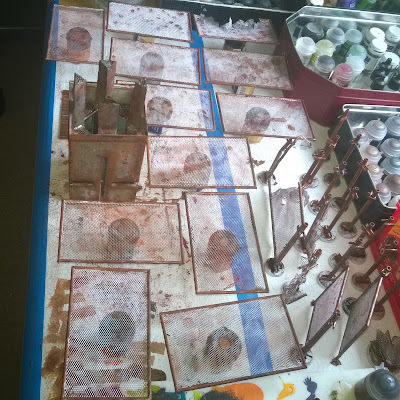 It worked really well; using successive coats of Dryad Bark, Dark Flesh, Khorne Red and Troll Slayer Orange I built up a heavily rusted effect, a final light sponging of Caledor Sky gives an impression of flakes of the original blue paint still clinging to the heavily weathered metal. To finish off the effect and to smooth it all together I washed all the pieces with Reikland Flesh, followed by dabs of Seraphim Sepia and finally Agrax Earthshade whilst the 1st wash was still wet, this has the effect of randomly blending the 3 shades giving a really dirty finish, I use this method on my Orks too. On the uprights I wasn't quite happy and wanted an even more rusty look so I tried an orange wash all over them. So not much left to do now, all the uprights need their bases doing, this will involve mud and some swampy plant life. 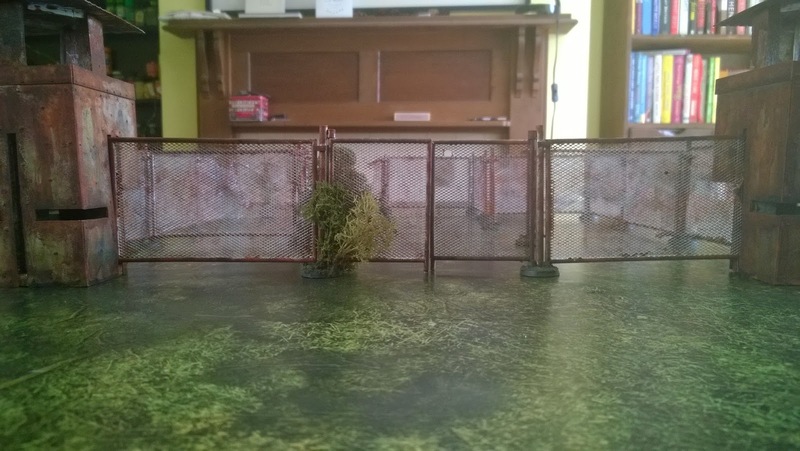 I plan to have vines and creepers climbing the uprights and some of the panels too. I'll probably leave the tower, however I've got some barbed wire on the way which will be formed into coils to sit on top of the fence and form a protective "shelf" around the tower below the parapet. 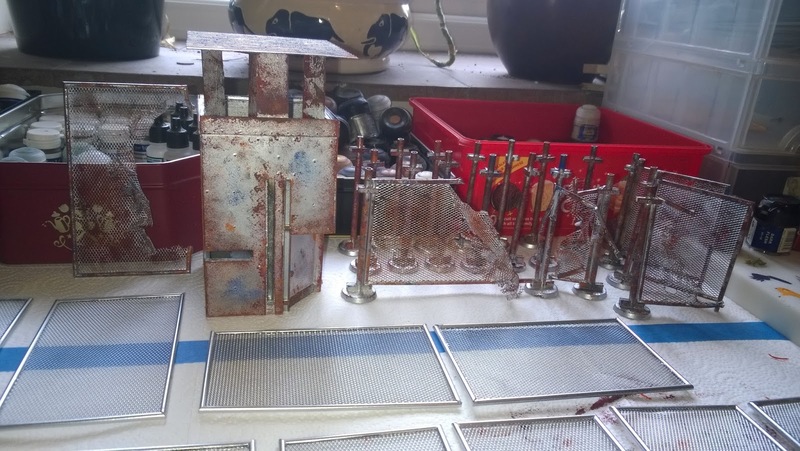 Then of course I need to build and paint at least 1 more tower, eventually there'll be 4 intact towers and a couple of collapsed ruined towers as well. 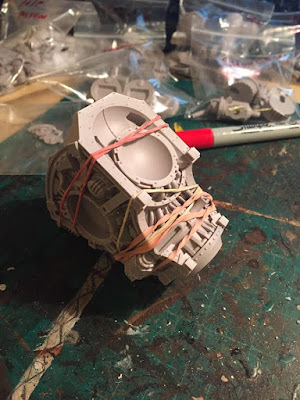 Today I am sharing the build process for my Knight Acheron. I have to say first off GW the instructions are rubbish! and has clearly been photocopied lots of times! Anyway this my first forgeworld knight my other knight is a plastic kit. The first thing to do is wash all the parts and make sure all the parts are present. One of my friends has recently had a problem with forgeworld not wanting to replace a missing part without proof of purchase. 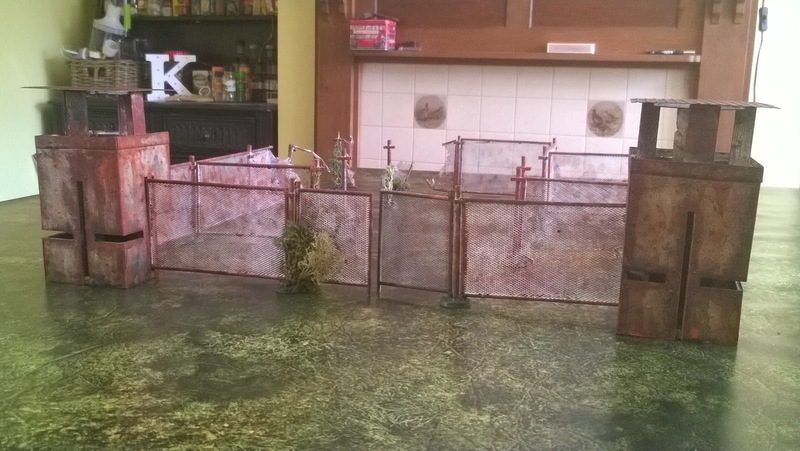 This was very frustrating after I was with him when he bought it for cash at a forgeworld open day. Anyway after proving he ordered some other stuff for delivery on the same day they relented. So guys advice is keep or get a receipt and check the parts when you get home even if you don't intend to build it in the near future. The next thing I did because I knew I would do the build over several days is split the parts into sections bag them and label them as can be seen in the first picture below. The first section I constructed was the body and cockpit, I have to say no matter what I did I couldn't get this to fully line up so in the end I went with best fit and have since filled the minor gaps with green stuff. Top tip for any new folk out there elastic bands! Also leave it a good while to go off. 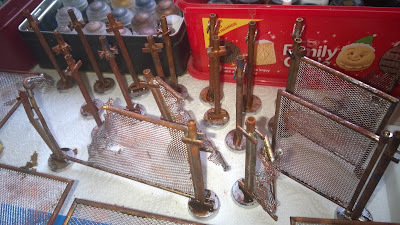 Next I cleaned up all the armour panels although I have no intention of gluing any to the model until after the paint job has been completed. 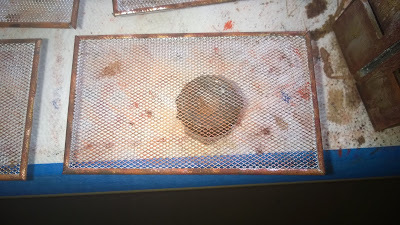 Next top tip be careful around the thin bits of resin as you can see from the next picture. 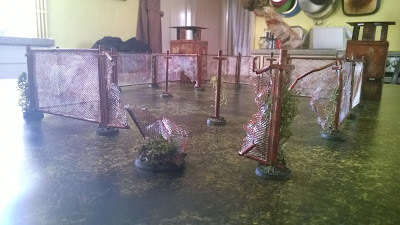 I should not of used cutters in this area. I think gently cutting away with a sharp knife would of been more sensible. 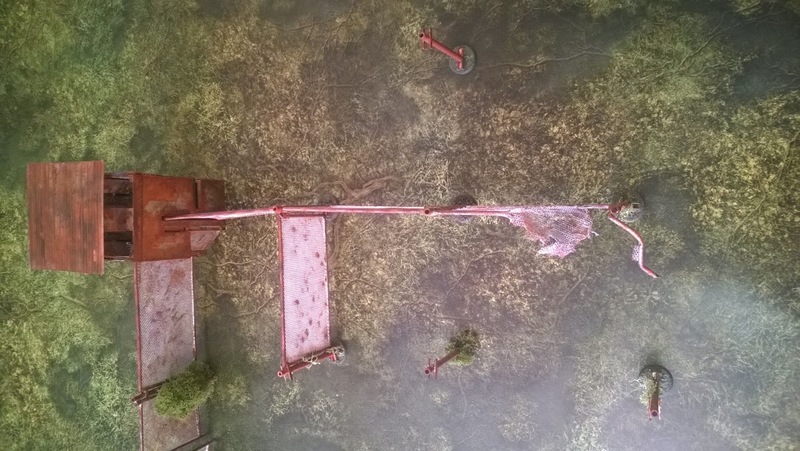 I have since fixed this with green stuff and hopefully after painting and weathering you wont be able to tell! 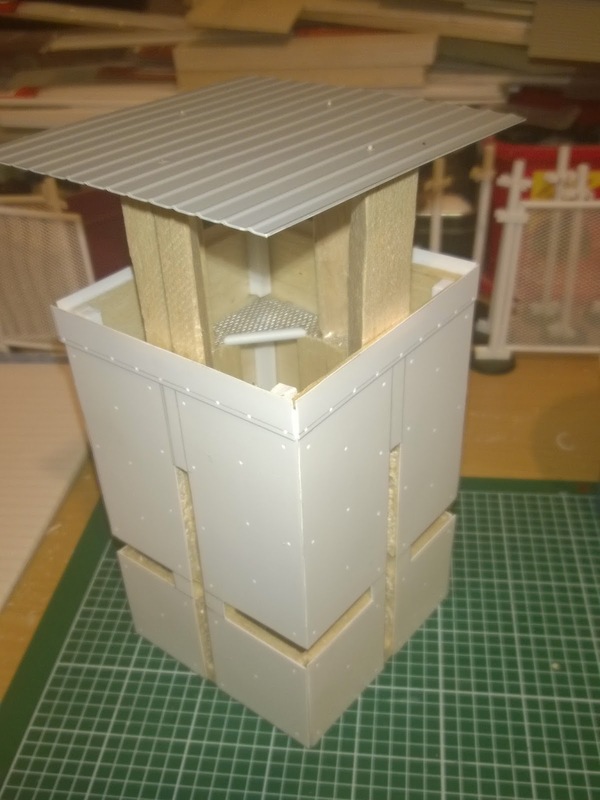 At this stage I then realised I needed to design the base to allow me to start constructing up from the ground. 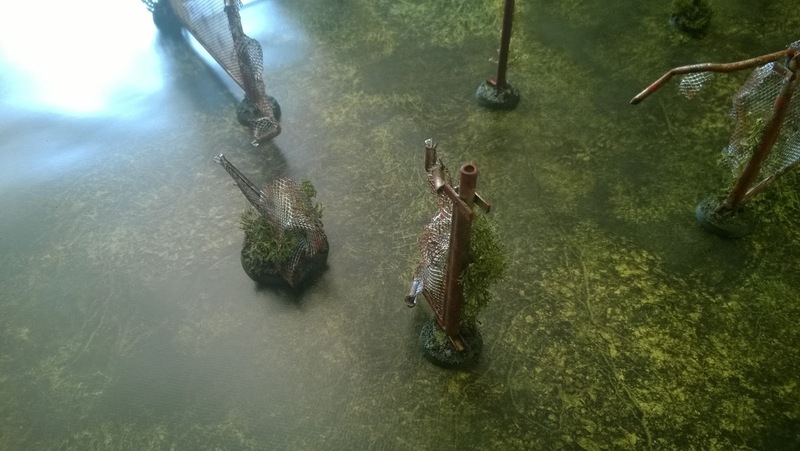 So I toyed with full city fight ruins and so on but then thought I don't always use models on city fight terrain. So I scaled back to the design below and aim to have the one foot stood on the barrel. The fantasy grave stone is more for a bit of fun and will be adorned with one of the code40ker's name for a laugh! The knight head will also be painted to match one of the code players knights. So from this point on I started to pick up speed as the excitement takes you onwards. First thing was working out the foot on top of the barrel and I actually drilled and pinned the foot to it. Once I had the first foot in place I blue tacked up the legs to work out where to position foot number two. I wanted to ensure the hip joint wouldn't look to unnatural. 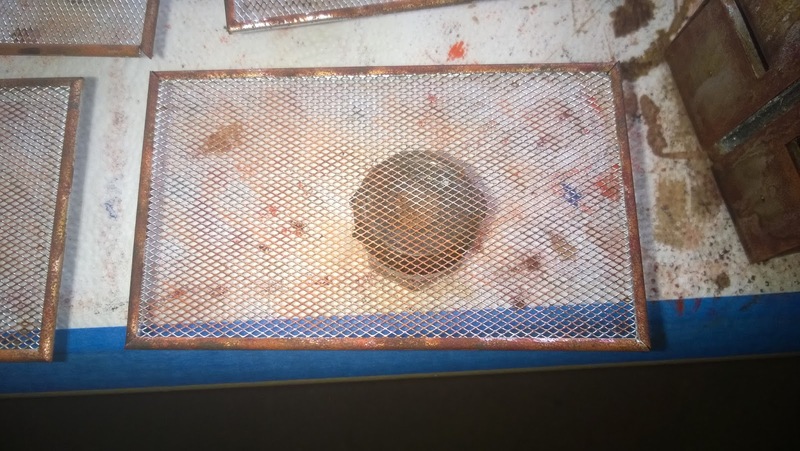 Ok so now I got really excited and stopped taking pictures of the process (woops). 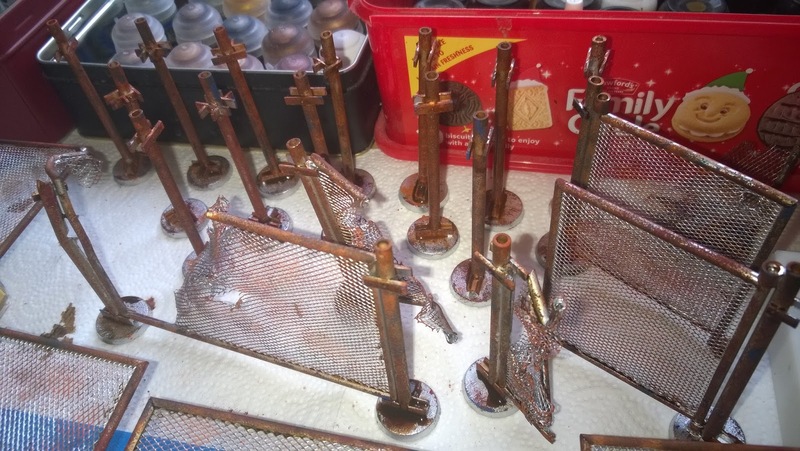 So the next picture shows all the sub assemblies ready for painting. I will say I used the hairdryer as per the instructions on the cables on the back of the legs. Next top tip "You literally only need it on for 10 seconds tops" any more and it goes very floppy. 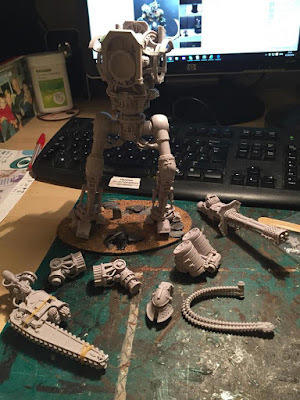 Well that is the completed sub assemblies next I will consider a colour scheme as my other knight is Gerantus the Forgotten Knight (who can be found here) I will need to consider whether I go with another freeblade or consider a knight household? Any questions, tips or thoughts please comment constructively below.